We offer a repair and maintenance service for all rolling security shutters both for domestic, commercial and industrial products. Whether your shutter is electrical or manual, big or small, we have the expert knowledge to do the job with the minimum of time and cost. Current call out charges apply. WHY NOT! REGISTER NOW To be a VIP Client ! and become one of our many registered clients who have the” piece of mind”, that there is someone out there you can call upon who knows you, the job, and your shutter details. “Powered Industrial Roller Doors require annual servicing as a matter of LAW! Health and Safety in Industrial premises and work areas”. 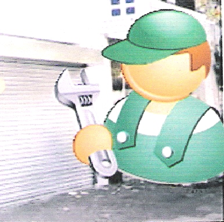 Our VIP Registered client’s annual service contract has NO call out fees and includes for preferential and efficient emergency repairs with same day response to secure or repair any of your roller shutters on your site, also including ONE annual service call . All permanent repair work is guaranteed for 12 months on any new parts fitted plus labour. *Labour on site charged at current hourly rate.